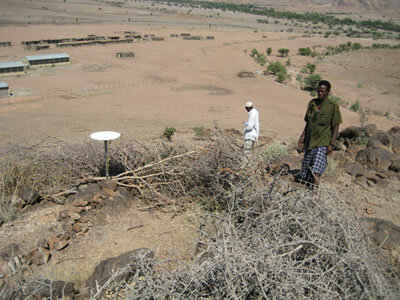 2009 was the third year of UNAVCO support for the Afar Rift project, located in eastern Ethiopia. A 60 km long dyke opened up in the Dabbahu segment in 2005 that marked the beginning of a continuing rifting episode. New intrusions, with associated seismic activity, have occurred regularly every year thereafter, making the rift one of the most active in the world. PI Eric Calais of Purdue University has overseen the deployment of numerous continuous and campaign GPS systems in and around the rift with the goal of investigating diking and post-diking processes and the long-term development of rift segments. Calais' network consists of 14 permanent GPS sites (CGPS, all of which are manual download) and over twenty campaign sites spread around the rift area. The majority of the CGPS stations were installed in 2006/2007 and are visited for routine maintenance and data download on average of twice a year. The campaign sites are resurveyed on an annual basis using UNAVCO equipment and engineering support. NSF funding for the project will terminate at the end of 2009. However, Calais will be submitting another proposal to fund future campaign surveys as well as the installation of satellite communications equipment at 5 of the permanent sites. Project participants for the latest field trip in October included UNAVCO engineer Sarah Doelger, Laura Bennati of Purdue University (PhD student for Eric Calais), Barbara Hofmann of Leeds University (PhD student of Tim Wright, collaborator on the Afar project), and Elias Abebe, a masters-student collaborator from the University of Addis Ababa. 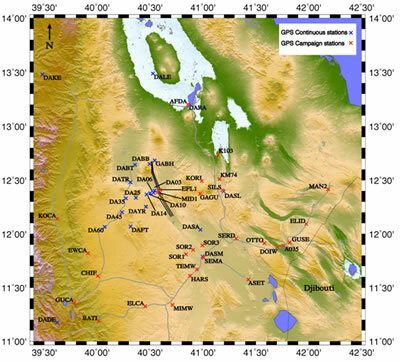 Figure 1 - Map depicting the GPS network surrounding the Dabbahu Rift (black diagonal lines). Continuous stations are in blue and permanent stations are in red. Many sites are difficult to reach due to poor road conditions and necessitate the use of 4 wheel drive vehicles for access. 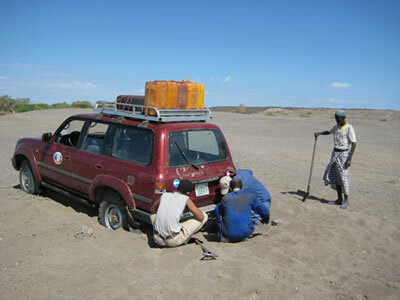 Figure 2 - Much off-road driving had to be done to reach many of the sites. Some attempts to deploy systems at the more remote stations were not so successful. Figure 3 - Permanent station DAFT, located above the small village of Finto, directly to the west of the rift. Many station guards surround the equipment with a barricade of thornbush branches in an attempt to keep out vandals.